This module will amplify the programme of the main controller - it cannot set its own scene. 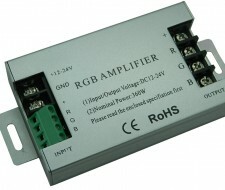 It has three channels each with a 10 Amp capacity. Multiples can run different LED products that operate on 12/24Vdc voltage. Only one transformer can run per controller or extension.